being first and foremost a dj, pure element played in clubs and bars all around the country and energized the crowds throughout the nations by fusing electronic elements, live musicians and experimental vocalists. Today his sets cross and mix-up boundaries including soulful, electro, minimal, tribal, deep and underground house. His emotion-triggering performances now even elevate the dancefloor of corfu (greece), making it an “international hotspot”. 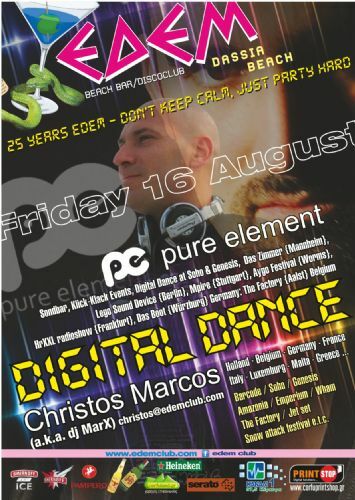 since 2006 he has an annual residency there and plays during the summer months @ club edem-dassia.